Today our school hosted a “Conference on Education” led and facilitated primarily by our own faculty. In addition to providing AV support for the keynote and breakout sessions, I co-presented a session with Megan Thompson, our lower school art teacher. The title of our session was, “Classroom Creativity: The Longer Path to Success.” Megan and I have been collaborating the past couple of months, and among other things I’ve helped her start using a free AudioBoom channel (SeeingNewShapes) to help her students record and share reflections on their art work. 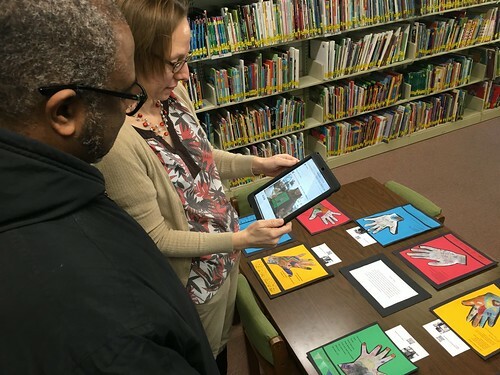 It was awesome to see students, parents and staff last week during her “Lower School Art Show” scanning QR codes to hear students discuss and reflect on their artistic creations! Megan has also started a classroom website on Google Sites, which I helped her configure with a free CNAME change so her site has a custom subdomain on our website: seeingnewshapes.casady.org. 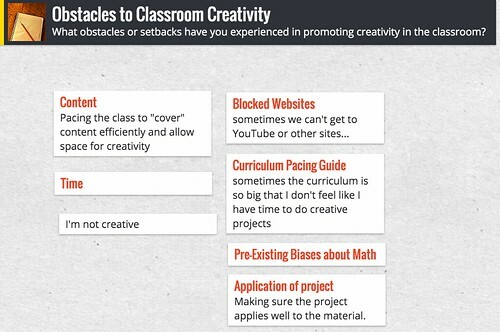 For our first activity during our 1.5 hour session, we brainstormed obstacles to classroom creativity using a Padlet as an interactive writing space. a drawing exercise, where an artist draws the contour of a subject without looking at the paper. Our third activity was a narrated art / narrated photo project, using an iPad and the free app “Voice Record Pro.” Teachers who wanted to (we didn’t force anyone to participate) shared some short reflections about strategies we’d discussed or thought about which can help develop a creative classroom culture. Our sample recording is just over two minutes long.